Brief Description of Subject: Christ suspended on cross with thieves on each side and Mary and John at foot. 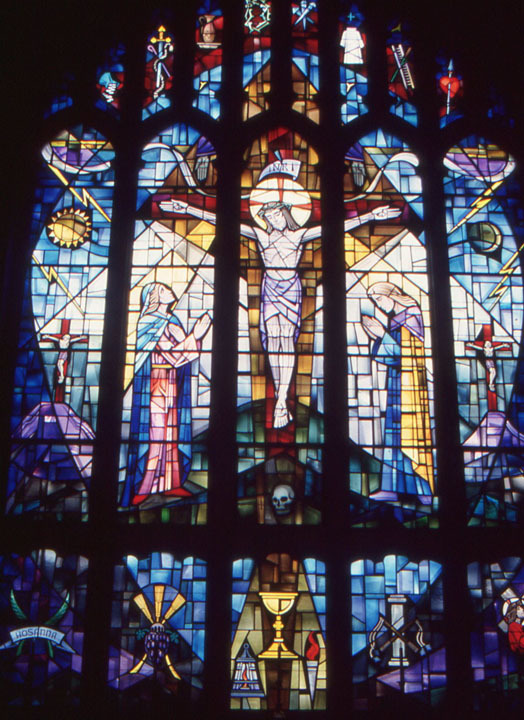 Below cross is a deformed skull representing Adam’s sin and the truth of the scripture,”the wages of sin and death”. (glass actually bowed). Many kites around window have a bearing on the subject of the traditional symbols of the passion. There are hands seen in the clouds, a symbol of heaven and the heavenly father. The symbols in the lower panel refer to events which preceded the crucifixion.